Posted October 2nd, 2016 by Mike Boyes & filed under Attitude Formation Change, Group Processes, Interpersonal Attraction Close Relationships, Social Perception, Social Psychology, Social Psychology, Stereotype Prejudice Discrimination, Stress Coping - Health. Description: How do you feel about clowns? When my brother and I were young there was this toy clown was about a foot and a half tall that we’d somehow acquired from somewhere and which we both decided it was just creepy. In fact, it was so creepy that we took it in hit it inside the foundation wall of our basement so we didn’t look at it. I have no idea what happened to that clown doll but I have to admit as a child worrying a little bit about whether would find its way out of the wall in the basement. What is it about clowns that leads to such strong feelings among people of all ages? The article linked below looks of this phenomena from a couple of angles. First of all, it seems to be a tendency for there to be flurries of reports about evil, luring, stocking clowns usually near wooded areas that pop up time to time in the news. Second of all if you ask people to define what makes someone seem “creepy” and then ask them to name an occupation are somewhat creepy might actually work clowns are on the top of most people’s lists. Why might this be? Well social psychology may have some at least partial answers. Source: Frank T. McAndrew: The psychology behind why clowns creep us out, New Zealand Herald. It may well be that noticing that someone seems “creepy” potential he has some survival value. Whatever does that make someone seem strange cause us to want to back away from them or move away from them might in fact be removing us from possible harm’s way. Psychologist Frank McAndrew’s has conducted into research what makes others seem creepy to us. It seems that strangeness and unpredictability are key factors in creepiness to whether its bulging eyes a peculiar smile for extra-long fingers or feet it is things like that increase the likelihood that we may be “creeped out”. The kicker is that when you ask people to identify occupations that people find creepy clowns top everyone’s list. In the course is nothing like confirmation biases to convince people that their feelings are perfectly justified. So for example when serial killer John Wayne Gacy was captured and it was discovered that he had appeared a number of children’s birthday parties as “Pogo the clown” after was also discovered that he killed at least 33 people and buried them in the crawlspace of his home people’s feelings of “creepiness” in relation to clowns or simply confirmed. What sort of evidence did Frank McAndrew find that helped develop a better understanding of what sort of things contribute to our feelings of creepiness in the presence of other people? 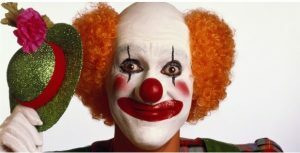 What are some of the challenges you can think of in designing a study intended to investigate why it is that people feel creeped out by clowns given that the idea of clowns being creepy seems to be fairly general a shared? What you think should be the implications of the findings of the sort of research? Should we outlaw clowns? Are the some things we may be up to do to try and rehabilitate their public image?